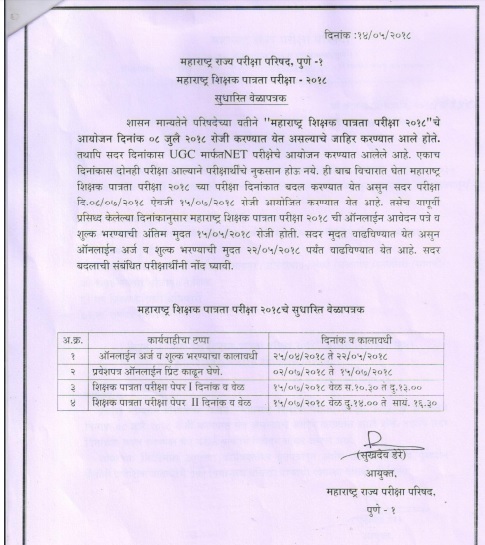 MAHA TET (Maharashtra Teacher Eligibility Test), Maharashtra Published Exam Notification for Teacher Posts. 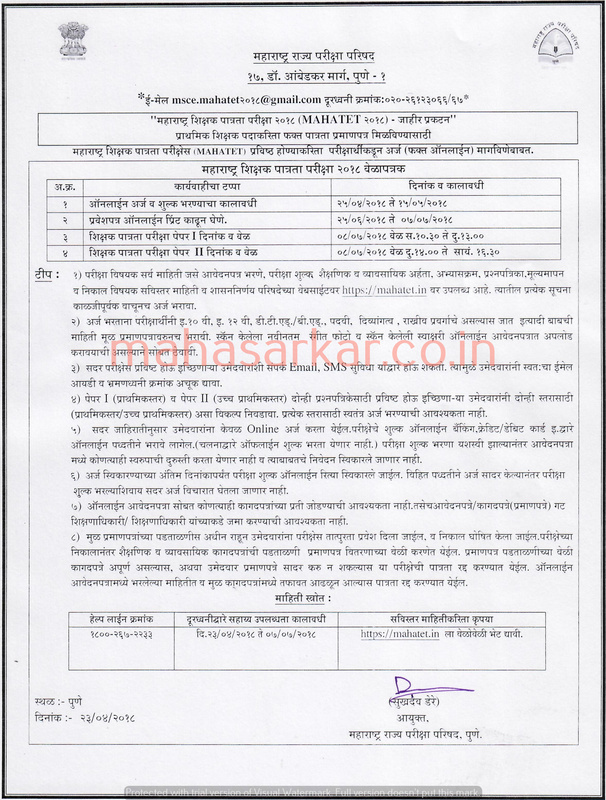 Candidates who wish to apply must look at MAHA TET Teacher Recruitment 2018. Eligible candidates can apply Online before 22-05-2018. Interested & Eligible candidates can apply online through the website mahatet.in earlier than the due date. Starting Date, Last Date to Apply Online at Maharashtra Teacher Eligibility Test which candidates should be remember as follows. Start Date to Apply Online: 25/04/2018. Last Date to Apply Online & Submission Application fee: 22/05/2018. Teacher Eligibility Examination Paper I Date and Time: 15/07/2018, Time- 10.30 am to 01.p.m. Teacher Eligibility Examination Paper II Date and Time: 15/07/2018, Time- 14.00 pm 16.30 pm. Where should I get the MAHTET Registration ID & Password after Registration? After Successful registration MAHATET Registration ID & Password will be sent over the Email ID/Mobile number which is used at the time of registration. How payments will be accepted? How to get the User ID & Password? Candidate will fill the registration form available on MAHATET website, on successful submission Candidate will get MAHATET Registration ID / Password over Mobile Number & Email ID provided on form (Used at the time of Form Submission). You might have entered the WRONG mobile number so please check your registered email Inbox / Spam box to get the MAHATET Registration ID /Password (Vice-a-versa). If provided Mobile number & Email ID both are Wrong then kindly Re-register yourself with new/valid email ID & Mobile number. What are the documents required to be uploaded on Registration/Application form? No documents should be uploaded at the time of filling Candidate registration form. On Application form user will have to upload his latest Photograph & Signature separately. How to edit the Candidate photo on Application form? Candidate can edit photograph before making payment. Once the payment is done successfully candidate wont be able to edit photo or other information in application form. For changing photo (before making payment) click on “Edit Application”Tab, a form will open where user should click on“Choose File”option on Candidate Application form & upload new photo. “Save & Preview”–>“Submit”the form to save the changes. How to edit the Candidate information? If you have successfully paid the MAHATET application fees then you CAN NOT edit the Candidate details on Application form. For changing candidate information (before making payment) please select “Preview”Tab on Candidate dashboard. At the bottom of the“Preview”Screen you can view the“Edit”button please click on this button to change the Candidate details on Application form. Only after the successful payment of the exam fees Candidate will be Successfully registered on the system. Please take the printout of MAHATET application form post successful registration. How to pay the Candidate fees online? From where I can check the Payment status & download transaction receipt? Click on “Transaction History”option on Candidate dashboard to check the Payment status & also you can view/download the receipt for performed transactions. What is the cutoff date for MAHATET Application? Is Aadhar Card a Mandatory field? Yes, Candidate will have to either provide his valid Aadhar card number or Aadhar Enrolment number. After performing the transaction getting status as“Transaction failed”what to do? After performing the transaction getting status as“To Be confirmed”what to do? Keep checking if the Candidate is registered within next 3-days. Contact your bank & check if the payment is confirmed. If that transaction gets failed then amount will be refunded to your account. If you are applying at last stage then its better to perform new transaction to confirm your MAHATET Application. You are missing fields at the time of filling registration form. Kindly fill the form fields SEQUENTIALLY (One By One) without missing any field to overcome this issue. मैं MAHATET पंजीकरण आईडी या पासवर्ड भूल गया, क्या करना है? नाम परिवर्तन स्थिति क्या है? आवेदन पत्र पर डीओबी / ईमेल आईडी / मोबाइल बदलने में असमर्थ? मेरे पास आधार संख्या / आधार नामांकन संख्या नहीं है? Form is disabled for me? If you select Nationality as “Other” then form gets disabled for you, select your nationality as “Indian” to continue with the Application. What are the applicable fees for the exam? You can ONLY print the application form after successful Payment. Can I make changes to Application form after Payment? You can not make any changes after successful Payment, so kindly Preview the form before proceeding with Payment. MAHATET will be conducted in how many Mediums? शुल्क रियायत के लिए मानदंड? Is there any Age limit to apply for the MAHATET exam? No Age limit to apply for MAHATET exam. No, the candidate can not use previously used Email ID or Mobile number for another registration. Email ID & Mobile number for Re-registration. क्या मुझे पेपर -1 और पेपर -2 के लिए अलग से पंजीकरण करने की ज़रूरत है?